I read a Mother Jones article by Chris Mooney this morning. Chris is typically cited by climate activists as trustworthy and comprehensive. Overall, his work is good. Based on my recent social science experience, I now tend to view Chris’ work as scientifically comprehensive but lacking in some important social science details. Be that as it may, his recent piece is worth a read. His piece dealt with climate change skeptic’s recent handling of what’s been termed the global warming “pause” or “hiatus”. Skeptics, scientists, and activists penned a growing number of pieces on this topic in recent months, which is the latest phase in a multi-year trend. Chris’ piece addressed this by way of a Climate Desk Google Trend graph. “Global warming pause” skyrocketed in Google searches prior to the IPCC’s Summary for Policymakers official late-September 201 release, following an August draft leak. Unsurprisingly to anyone who follows climate related news, the IPCC tried to respond to this growing skeptic’s argument and did so poorly. What is the argument? That global warming has stopped, or slowed, or paused, or is in hiatus. Any number of time series graphs that compare the continued and accelerating rise of CO2 concentrations with annual mean global surface temperatures motivate this argument. And here I raise an important first point: activists did themselves a disservice by exclusively focusing on those very same global surface temperature trends. Granted, the easiest detectable climate change trend is probably global surface temperatures, but dominant focus on this single variable picked from a complex, non-linear, interrelated system wasn’t the best idea. That said, the aforementioned comparison graphs show the following: CO2 concentrations, after removing the annual cycle, increase year after year. Global mean surface temperatures however show a recent slower rate of increase in recent years than they did in the 1970s-1990s. Doesn’t CO2 directly cause a temperature rise? Citing the climate system’s inherent complexity, the answer is not a simple one. Many factors influence global mean temperature. The skeptic’s however employ a well-worn and incorrect strategy: examine the temperature trend since 1998. 1998 was a very warm year globally due to a very strong El Nino. When you calculate a short-term trend and start with an anomalously high value, the trend will be smaller than if you start with an average year. Similarly, if you calculate a trend starting with an anomalously cool value, the trend will be larger. If we’re interested in climatic trends, the time period used has to be greater than 30 years. This is primarily due to natural, short-term effects that are present even while the entire system is gradually warming over the long-term. If you want to measure the long-term warming, you have to measure over a long-term. It sounds like common sense, but people who don’t perform analyses typically don’t examine the details. If skeptics knowingly abuse the methods and present information to the public, they misinform the public. 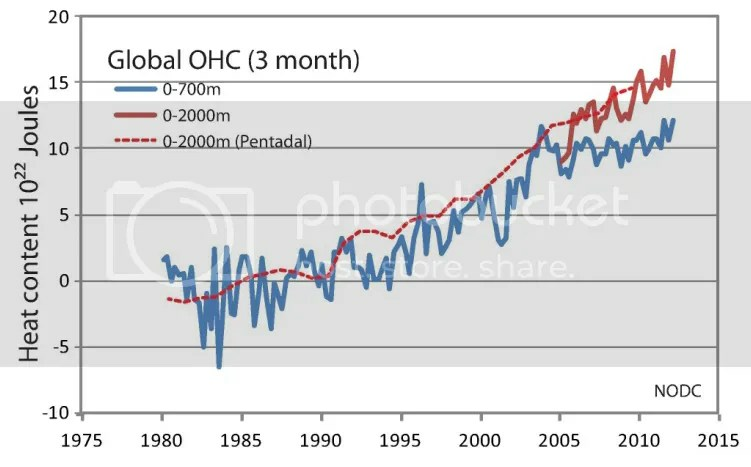 Figure 1 – 3-month running mean of Global Oceanic Heat Content (OHC) from 1980 to current. Oceans absorbed heat in the top 700m of the ocean at about the same rate as the top 2000m through the year 2000. Since then, the bottom 1300m of the top 2000m continued to absorb heat while the top 700m absorption rose more slowly. Physically this means deeper parts of the ocean are absorbing heat. Climate observations are unfortunately spatially limited: we don’t observe the top 2000m as well as we do the top 700m. Furthermore, we don’t observe the bottom 2000 to 3000m as well as the top 2000m. This science is relatively new but fairly robust. Research will uncover additional details of this phenomenon in the future. Which leads me to my next big point: the big-picture science behind climate change is settled. It has been settled for a long time. Disagreements over the exact forcing of aerosols or oceanic heat uptake, to name just two, will not change the big picture. Humans are now the dominant change of Earth’s climate. We will be so long as we change the chemical make-up of the atmosphere and ocean. The long-term, climatic global surface temperature trend (>= 30y) is unequivocal: it is rising. If the hiatus lasts an additional 20 years, it will become a noteworthy 30-year trend, but it still won’t eclipse the 100y+ trend. A comment regarding CBS’ incredibly poor reporting on this topic based on this quote: “Another inconvenient truth has emerged on the way to the apocalypse.” This is one problem with apocalyptic language employed by climate activists. When the apocalypse doesn’t occur on very short time frames, people can cast legitimate doubt on your claims. The bigger problem is this: activists’ use of catastrophe language shuts recipient’s response centers down. What the activists are missing in their communication is any glimmer of hope or discussion of solutions. But CBS only (unsurprisingly) reported on part of the weather system. They didn’t report on the climate: they focused on a short time period of just surface temperatures. There are many more components of the climate system. A comment regarding Chris Mooney’s language. CBS didn’t interview a climate skeptic. They interviewed someone who feels, as many others do, that doomsday scenarios and catastrophic apocalyptic language (see above) harm climate discussions. I feel this way. And it’s not because I’m a skeptic. Instead, I have studied more than just physical science climate journal papers. I have studied social science climate journal papers. Climate activists are as tribal as anyone else: they like to claim that skeptics don’t “believe or know the [physical] science”. Well, they should spend some time in front of a mirror. Social science results are, I would argue, just as important as physical science results. And social science results back up my contention that catastrophic language use is detrimental to the ultimate goal: doing something. Psychology results demonstrate that this language precludes people from taking action or discussing policies – which is exactly the opposite of what climate activists claim they want to do. But I would go further than Mooney: physical scientists bear most of the blame for allowing hijacked messages. By ignoring social science, physical scientists undercut their own efforts. They want to absolve themselves of culpability, so they blame the media and skeptics. This will not change until scientists realize there are different lenses through which they can operate. You don’t have to take my word for it. What is the US’s climate change policy? Despite decades of physical science research and climate activism, we still don’t have one. Many other countries, including China, do. What is the international policy? Again, despite four previous Assessment Reports, there isn’t one. It boils down to this: our current approach (in use for more than 30 years) doesn’t work. It will not work. Nothing will change with a Fifth Assessment Report that shows many of the same things as the previous four. The IPCC is not the best entity to handle international climate change policy. Its strategies have not and will not work. Issuing a big report every six or seven years is the wrong approach. As others have noted, why not issue much more nimble and focused assessments much more regularly? Change communication strategies. Current efforts work more for skeptics than activists (i.e., you’re hurting your own cause). Top-down governance of this issue is not feasible. The IPCC should spend more effort on facilitating bilateral and multilateral agreements. Identify and codify common ground wherever it exists. Set up some small measures that are easily successful and initiate some inertia. Larger efforts will flow from smaller. I can hear activists’ response already: we’re almost out of time and we need to implement a big effort now. This ignores historical failures and their causal factors. It is time to do something different. We can mitigate some amount of future climate change starting with small efforts, then more change with larger efforts. Or we can continue to mitigate no future climate change by repeating mistakes and failures. Categories: framing, global warming, policy, science | Tags: Chris Mooney, climate communication, climate skeptics, CO2 concentrations, global temperatures | Permalink.